I am new to closeup photography and am using a Canon T1i (500D) with the 100mm f2.8 USM macro lens. I have no need for magnifications greater than the 1:1 provided by this lens. With DOF in the few mm range I cannot get the consistent results I want my manually moving the focus ring on the lens to do focus stacking so I think I need to add a focusing rail to my kit. Cost is a consideration. In addition, I want a solution that I can mount on a tripod so a linear stage, such as the Proxxon 27100 or other bench solutions, will not work for me. My primary subjects at the moment are flowers and plants. One possibility is the Adorama Budget Focusing Rail (http://www.adorama.com/SearchSite/Default.aspx?searchinfo=budget%20focusing%20rail). I am concerned that it may be very difficult to advance a rack and pinion focusing rail in increments as small as one or two millimeters. Is advancing in small steps a problem with a rack and pinion rail? The other alternative I have found is the Hakuba/Velbon Micro Slider (http://www.adorama.com/SearchSite/Default.aspx?searchinfo=hakuba%20macro%20slider). This uses a worm gear and advances 3.9mm per full revolution of the knob so advancing in increments of one or two millimeters should be easy. Any comments on the two alternatives above or alternative suggestions would be appreciated. I don't know if it is relevant but I have tried CombinZP and Helicon Focus and abandoned both since I get much better results with Zerene Stacker. I have one of the Hakuba/Velbon sliders you linked to. It might work for you, given that you’re staying at 1x and below. The cost is fairly low, and the device does work. But I have no love for mine. It’s a bit like using a Velbon tripod, and then trying out a Gitzo tripod with a Markins head—you suddenly realize how awkward and frustrating the Velbon was, and why you avoided using it. But the Gitzo/Markins setup might cost $1000, compared with a $150 Velbon. Cost is a consideration to me, too--but if one uses the Velbon three times and gets tired of it, that’s $50 per use; if one uses the Gitzo/Markins 5,000 times because it is easy to use and quick to set up, that’s twenty cents per use. My Velbon macro slider, looking back, was pretty expensive on a per use basis, because owning it simply made me realize that I really needed something better. Since I'm not rich enough to buy things twice, I tend to think in terms of buying the right thing the first time, and in the case of the Velbon macro rail, I failed to do this. But then, 1x is not a comfortable limit for me, so our needs may vary considerably. And the Velbon does do its job, within limitations. For whatever it's worth, here is my field rig: http://www.photomacrography.net/forum/viewtopic.php?t=12722&highlight=bratcam It’s based on an old microscope focusing stage that I modified. This isn’t hard to do, but may be overkill for 1x and less magnification. Still, I find it very pleasurable to use even at lower magnifications. Similarly, I suspect some of the other “bench solutions” could be easily modified for use on a tripod. I mount some components of my studio on Arca-Swiss style rails, partly because this allows them to be placed on a tripod if ever needed. And I'd suggest taking at least a quick look at the the StackShot focusing rail and automated controller. This setup definitely costs more than the devices you’re looking at, and may be overkill at 1x. But it provides enormous bang for buck, and will continue to serve you well if you ever go to higher magnifications. Chris' advice is sound, and his equipment solutions are exquisite, but I believe perhaps "overkill" for your needs (and budget). He routinely works with magnifications that have between 100-200X less depth-of-field(!) than you will experience if, as you say... "I have no need for magnifications greater than the 1:1 provided by this lens". Either the Velbon or the Adorama rails you mention will allow setting adequate increments and work for you... with some caveats. Both of these are "4-way". In the "field", on a tripod, all you really need is a forward and backward movement. The lateral movement could be of some use I suppose, but it comes at the price of greater size, weight, and (because of extended height and additional "connections") less stability. The lower the profile, the better. So if I were to use either of these for field use I might actually remove the base (lateral movement) from the Velbon, or just use the geared 2-way movement on the Adorama. (Just using the one platform on the Adorama, it would be awkward to attach and remove the camera since you would need a coin, or key or something similar to turn the screw. You might be able to replace the existing screw with an appropriate thumbscrew). Normally I prefer a rail that does not keep the camera fixed at one end (as with the Velbon). If you ever need to use it with a small lens that has a short working distance the rails jutting out in front can extend past the subject and cause problems. (And mounting the camera facing the other direction is impractical). But since you are using it with a 100mm macro this will not be an issue. Of the two you mentioned I would probably choose the Velbon for use with the T1i and 100mm macro. (If it seems too bulky with the lateral base, I believe it is simple to remove via a 3/8" screw. I don't have one so perhaps Chris can confirm this). Items 400235518750, 400233326534. (But these look to be overpriced, I've seen them go for less). Thanks for your thoughtful comments. I agree that Chris' suggestions are sensible and his equipment is indeed impressive, however, I suspect that Chris has move invested between the ground and the bottom of the camera than I have in my entire photography kit. I am retired and do this as a hobby. I agree with your comments about not needing a 4-way rail, however, until now the only 2-way rail I found within my price range is the Manfrotto and many users report excessive play between the rails that causes loss of image registration when the camera is advanced. Thanks for the reference to the two Novoflex Castel rails on Ebay. I may put in a bid and see if I get lucky. I have done some addition research on the Velbon and found a user review in which the user refers to easily removing the lateral rail to make a more compact 2-way rail. Thanks for pointing out that possibility. I have been lurking in these forums for about a week and have looked with fascination at several bench and field setups for high magnification work. I gather that everyone engaged in high magnification work has access to a machine shop and the fabrication skills needed to make adapters between linear stages and cameras or to cut microscope frames etc. I saw a reference to the Proxxon 27100 linear stage which looks like excellent device for the price. However, I can't see a way to mount a camera on it without a custom bracket that is held in place by the T bolts and has a 1/4 20 bolt to attach to the camera. I could design something that would work but I have neither the skills or the equipment to make it from metal. This is just curiosity since have have no need for a high magnification bench setup. For quite a while I used the focus rail part of the OM auto bellows for low magnification stacking, it should be fine at 1:1 - you can occasionally pick these up for silly money on eBay, I was recently outbid on one which went for about $40, I have two already but I couldn't resist having a bid at that price! Of course if your stuff is not OM oriented then you might need a couple of adapters as well to use the bellows, or the slightly hard to find camera mount which replaces the bellows and allows you to just mount any camera on the rail. The StackShot rail can be purchased separately and modified for manual operation without too much drama. If you're using Zerene Stacker, you'll have found that it's remarkably good at aligning frames. Helicon and CombineZP may be as good, I haven't experimented. You'll see that the order of alignment, indicated by the default setting, is "20%". That's huge! There are many examples on the forum where the advancing has been done freehand, no support at all. Obviously when doing that, there's a lot of movement sideways and up and down. This moth was about 1:1 on 24x36. I got myself comfy, held my breath and slid my hand forwards on a table for 30 something shots in about 15 seconds. Looking at the "unaligned" frames in Zerene, yes I wobbled a couple of millimeters this way and that. I fired when I noticed the focus shift on the subject, winding up with a few "too many" frames, at probably f/11 or 16. At 1:1 with your lens at its best aperture, perhaps f/5.6 , you'll have something like a quarter of a millimeter depth of field. That's quite hard to move on a rail with 16mm or so per turn ( Adorama) I'm not sure what the Novoflex rails' movement per turn is. So I'm going to suggest a cheap and nasty rail. Nasty in that if you change direction, the camera moves sideways a bit. If you do the clamp screw up for maximum precision per movement, the adjuster goes so tight you can hardly use it. But with the addition of a clothes peg to keep track of your turns, 1/12th of a turn ( think clock face) is about enough for 2-3 times magnification. I recently showed it here , a Manfrotto 454. Do a search on the forum and you'll find other opinions! Chris, using the DOF calculator at http://www.dofmaster.com/dofjs.html with an APS-C sensor camera, a focal length of 100mm, f5.6 and a subject distance of 12" (which is about 1:1 with this lens) it gives a DOF of 0.05" or about 1.27mm. Is this calculator inaccurate or am I missing something? I think it's the "distance" which is throwing you out. When I use that DOF calculator I get dof = 0! or our friend Andrew's site. Watch out too for Circle of Confusion differences. In the old days it was 1/1000 of the field diameter, but that can mean half a dozen pixels linear. Seems a shame to use an 18 MP semsor and divide that by 36 effectively! 1/1500th - 1/2000th, is probably about right. It's a little difficult to tell, because if you STACK a lot more images, the contrast etc comes out slightly differently, so you're trying to decide what's an "effect" and what's actual sharpness, so it's best to try it. I think it's the "distance" which is throwing it out. When I use that DOF calculator I get dof = 0! That calculator has a rounding problem. If you use 1 foot for the subject distance it gives a DOF of zero. If you use 12 inches it gives a DOF of 0.05 inches or 1.27mm. It's probably measuring lens to subject distance, which isn't what you're assuming. If you enter 20cm, it come up with 0.04cm, = half a millimeter. But it's working off the end of its accurate range. Try one of the others. where F is the lens aperture, c is Circle of Conf and M = magnification. You really need to go a different route to calculate close-up DOF (other than lens to subject distance). Here is a very abbreviated section of a spreadsheet for the Canon USM 100mm macro. (I used a circle-of-confusion appropriate for an APS-C sized sensor and a roughly measured pupillary magnification factor... P, as 0.33). 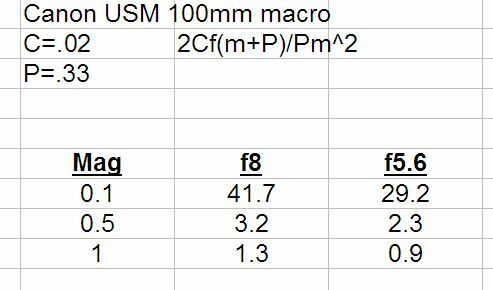 I'm not trying to get DOF accurate down to nanometers here , but for this focus rail discussion these values should be useful. I do think a focus rail with 3.9mm/turn would be a good "compromise" for the range of a 100mm macro. Fairly easy to accommodate the needs at 1:1, but no need to do a lot of "cranking" at more modest magnifications. I have one of those Manfrotto 454 rails and I never really warmed up to it. Just found it jiggled around too much when loosened to a degree that made it easy to adjust. But I was trying it at higher mags. And I was trying to "lock it down" for a shot, which caused a shift and change of composition. For a stack you would not want to "lock it" at each step, but on my sample it seemed tricky to find a degree of "snugness" that gave smooth movements. (Might be more usable for me at lower mags). I believe the Manfrotto is 1.2 mm/turn. This would make for a lot of turning if you are doing modest close-up stacks where you may want 5 or 6mm (or more) between images. (And I may be wrong, but it sounds like Bazsl may be doing much work in these ranges). That's also the conundrum with the Manfrotto for me... it is capable of rather fine degrees of movement fore and aft, which is what you need for higher magnifications. On paper it seems like a good candidate for the 65mm MPE magnification range. But the "wobblies" make it problematic at those higher magnifications. I do agree that the software is surprisingly good at aligning a stack (At least in my experience with Zerene and Helicon) so perhaps I am overstating the problem, but it just bugged me. http://www.photomacrography.net/forum/viewtopic.php?t=9016. ) But one benefit is that while it is pretty "quick" it is very smooth, so it is not that hard to move in smaller increments than might be expected based on the "specification". I believe (the Velbon's lateral base) is simple to remove via a 3/8" screw. I don't have one so perhaps Chris can confirm this. Yes, the lateral base is easily removable via a 3/8" screw turned with an 8mm hex key. This takes just a few seconds, and exposes two 3/8" threaded holes for mounting the remaining upper portion to a tripod; one of these holes contains a removable bushing to provide 1/4 threads. The upper portion used alone is quite a bit more solid than when used with the lateral base attached--a substantial improvement, if one does not need lateral adjustment. My favorite field rail for a 1:1 lens is the Novoflex Castel L. . . I've long admired that item. For a ready-made product for low-magnification use, it would be at the top of my list. Chris. . . routinely works with magnifications that have between 100-200X less depth-of-field(!) than you will experience. . . I suspect that Chris has move invested between the ground and the bottom of the camera than I have in my entire photography kit. I guess I didn't make my point very well. While I routinely do high magnification work, I also do my share at lower magnifications. The rig I showed does handle higher magnifications, but also works really well with a 105mm macro lens at 1x, 1/2x, or whatever. For that range, I simply use the coarse focus dial, which gives about 3mm/revolution, and is buttery smooth and very solid, vastly superior to the Velbon. On the downside, geared travel is limited to 3 cm. And while I do have a substantial investment in support equipment, this wasn't the point of the link to my field rig. If you look at the heart of that system, you'll see something cheaper than the Velbon slider and more capable, by at least some measures, than the Novoflex. It could be made to work on anybody's tripod. It's a $66 nikon focusing block with a bit of modification. I chose to stick an Arca-Swiss standard clamps on it for flexibility and convenience, but somebody without A-S gear could just as well put a 1/4" threaded plate on top and bottom. At its simplest, this should all cost under $100, even if paying someone else to do the metal work. (By the way, it was Charlie from whom I originally got this idea. I looked at his post dozens of times. Come to think of it, my Velbon slider hasn't seen the light of day since. I gather that everyone engaged in high magnification work has access to a machine shop and the fabrication skills needed to make adapters between linear stages and cameras or to cut microscope frames etc. (snip) I could design something that would work but I have neither the skills or the equipment to make it from metal. I don't have the equipment or skills to do metalwork either. But it's not necessarily bad value to to pay someone who does. A good fabricator can do a lot of good work in a short time, and I find it isn't so very expensive. A key here is to avoid paying for high precision machining, which takes time and therefore money. In modifying an old microscope focus block, you are salvaging a precision part where somebody else has already paid for the precision. Don Wilson, my fabricator, is emminently capable of precision machining, but we avoid that and keep the fabrication quick and inexpensive. Don will work with people via phone and email; his contact information is in my signature. Sonynut, at this forum, has also made at least one custom item for a forum member at an attractive price. And I'll bet that most locales have someone doing "welding and fabricating." Also, I'm pretty sure that one could modify a focusing block with an $8 hack saw, a $5 tube of epoxy, and a $35 set of Arca-Swiss clamp and plate from eBay. That would get you pretty close to the rig I use. Anyway, that was my point. Velbon slider: Inexpensive and, in my experience, clunky to use. Novoflex slider: More expensive, and likely a joy to use. Homebrew: Can be inexpensive, and definitely a joy to use. Charlie you must be using 1/1000th frame width for C of C? My old-design 105 micro Nikkor resolves rather better than 5 pixels I expect the newer Canon is better again. Bas you'll have to overlap your steps too, so actually move a bit less than the DOF. If you use a 454 and want to move more, you can just lift the "clutch" and slide the plate - it's calibrated. With a clothes-peg as a handle you can do about 2 turns per second, so 10mm doesn't take long anyway . You're right Charles, it's 1.2mm per turn not 1mm. If you can get a Nikon focus block for $66, good luck, I'd buy three now at that price! If seen very few, and they've been much higher. I paid about $160 for a coarser (?) Olympus BH-2 block, + $50 import duties + shipping of about $36. A couple of Chris Hejnar plates and clamps would add $220 plus shipping probably $60 then dutiies. That's about $600 before any machine shop work. My 454 was $100, it's $80 at Adorama. For coarser movements, this one would probably get the job done. Thanks to everyone. I have learned a lot from this discussion and you have given me a lot to think about.